Google Glass demo video. This might replace your smartphone in future. Cost US$1500 now. I commented on the youtube video: "We should start naming a disease that has the syndrome of look at right top side all the﻿ time." Wish you a prosperous year of Snake. It did happen to me, but this time I got ideas to write, I got apps to introduce, but I don't have enough to write a quality post, therefore I prefer to write a compilation than write a crappy post. So what happen on month of Jan 2013 on PenangUncle.com? If we have some files that is bigger than 1GB, then we are unable to download them. Luckily now there is another alternative, which is download torrent with Chrome. No, I am not talking about direct download, which the words "direct download" always appear in torrent sites, but it usually takes you to some malicious or dangerous or NSFW sites. BitTorrent Surf is a Chrome extensions that acts as a torrent client. To install BitTorrent Surf, you need to have Chrome installed on your system. I didn't try on Chrome of MacOS or Linux, but I think it should works as well. After you install it, you should able to see BitTorrent Surf icon on right of address bar just like other extensions' icon. Key in for files that you want to search for. Example here is Toy Story 2. By hovering the mouse over the icon, name, and bars, it will show you the address that actually has the torrent, how big is the file (in whole package, it didn't show if there is more than one file), and how many sharing. Click on the arrow down icon will start the downloading, and it will change to a tick icon. If you don't like the default search setting, you can add sites. The default search are using either google, yahoo, or bing. As you can see here, I added 3 more sites, eh-hem, eh-hem and eh-hem. And you can turn on or off each of them to fine tune the search. The icon in middle of icons are just notification. As for streaming function, I didn't try it. Somemore it says stream music library. Probably some new apps the developer trying to sell. During the installation of the Chrome extension, another program also will be install on your system, which is Torque. So I might have to say it might not works for MacOS and Linux. You will have to try first if you on these system/OS. Anyway, torque.exe is the one responsible do the P2P works. If you kill it, BitTorrent Surf will stop working. After the download complete, it should have a button on the same line of the download that you can open the folder that contains the files. 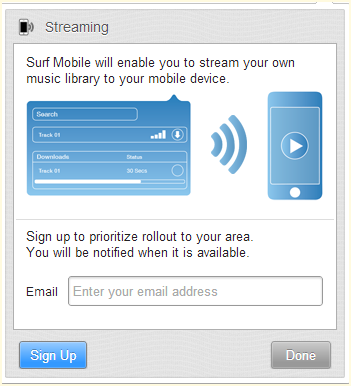 Since BitTorrent Surf is still in alpha, do expected some flaw/bug/error. 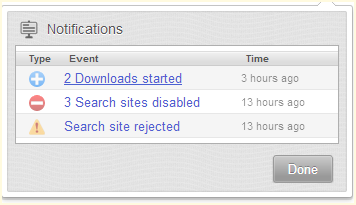 There was some moment that I cannot add more than one download, but the problem goes away after a while. I didn't reboot or anything. Note1: It is might be completely illegal to P2P movie/songs/files in your country. Note2: Do not enable this on your work computer/laptop. Your boss going to find out! You can disable the extension on Chrome (setting -> Tools -> Extensions) and then kill torque.exe manually. I wrote a batch file to kill torque.exe and others processes that I lazy to close individually. Note3: I noticed that emule is slowed down (until zero) whenever I switch on BitTorrent Surf. It might be co-incident, but I suspect both processes are competing with the ports. I shall continue monitor and update this post if I find anything. I always like stickies since high school time, it helps to remind me of project due dates, what should I focus on, what are the homework. of course that time that stickies is the real papers. It save money, I recycled papers that I collected from PC fair, at that time you can get whole stack of papers just take around at the PC fair, most of them just being print on one side, so I get to use the other side. When I start working, stickies still a great tool for me. There are a few stickies program for Windows XP. First version of Windows 7 come with a gadget that is exactly a stickies, however Microsoft removed it on sub-sequence version of Windows 7. Now with almost everyone on smartphone, there should be stickies for smartphone right? 1. You remember the numbers or words, then close the apps, open stickies and write it on stickies. Oh-no, what was the last digit? Okay, you have to open the apps just now and repeat the steps. 2. Write it on a piece of papers and then write it back to the stickies apps. Sigh. Now I found the real stickies on XDA forum. It works just like the one on Windows. It is called Floating Stickies. You can dock it to side of the screen, as well as resize it. I like it! Watch the demo video, I am installing this apps now! Since it supports Android 2.1 and above, majority of Android users can install and use it! I have a quick check on iTunes, no iOS apps works like this one. Take that Apple fan boys, muahahahaha. Nothing is going to escape this camera. Oh-oo.